The global cold pressed juice market is characterized by a focus on product innovation and positioning owing to increasing health consciousness among consumers, while understanding their nutritional and taste requirements and preferences. Manufacturers are focused on increasing their market coverage globally by enhancing production capacity to meet increasing demands for cold pressed juices. Players operating in the global cold pressed juice market have adopted an expansion approach by strengthening partnerships in high growth regions and expanding their product offerings across the global market through acquisitions and joint ventures. After a detailed study of the market, the analysts at Persistence Market Research have come to a conclusion that to strengthen market share, the key players in the market have to offer new and innovative products by augmenting their research and development capabilities. The analysts have studied various packaging techniques in detail while examining the global cold pressed juice market and found out that High Pressure Processing (HPP) is one of the widely used packaging options for cold pressed juice bottles. HPP technique is primarily used for liquid food products such as dairy products, fruit juices, and bio-active beverages that are packed into plastic bottles/containers. Persistence Market Research offers an eight year forecast of the global cold pressed juice market in a new report titled, “Cold Pressed Juice Market: Global Industry Analysis and Forecast, 2016 – 2024.” The study demonstrates market dynamics that are expected to influence the current environment and future status of the global cold pressed juice market over the forecasted period. The primary objective of this report is to offer updates and key insights on the expected future growth of the global cold pressed juice market. The report discusses various factors driving the market and also highlights region-wise trends in the global cold pressed juice market. It also provides a market outlook and sets the forecast within the context of the global cold pressed juice market segments – by nature, by type, and by distribution channel across the various regions assessed. This study discusses key regional trends contributing to the growth of the global cold pressed juice market, as well as analyzes the degree to which drivers are influencing the cold pressed juice market in different regions across the globe. Macroeconomic indicators such as food industry outlook, food and beverage spending, and others have been considered to arrive at the indicated market numbers. Yearly change in inflation rate has not been considered while forecasting market numbers. Top-down approach has been used to assess market numbers for each segment, while bottom-up approach has been used to counter-validate the reached market numbers. The report provides information on the drivers, restraints, trends, and opportunities in the global cold pressed juice market along with a comprehensive segmental and regional market forecast of the global cold pressed juice market, supported by key metrics such as CAGR, absolute dollar opportunity (critical in assessing the level of opportunity that a provider can look to achieve, as well as to identify potential resources in the global cold pressed juice market), incremental dollar opportunity, Year-on-Year growth rate (to understand the predictability of the market and to identify the right opportunities in the global cold pressed juice market), Basis Point Share ( to understand individual segments’ relative contribution to market growth), and market attractiveness index (to understand key growth segments in terms of growth and performance in the global cold pressed juice market). A competitive landscape has been included to provide report audiences with a dashboard view. Detailed profiles of key players are also included in the scope of the report to evaluate their long-term and short-term strategies, recent developments, key brands and products offered. 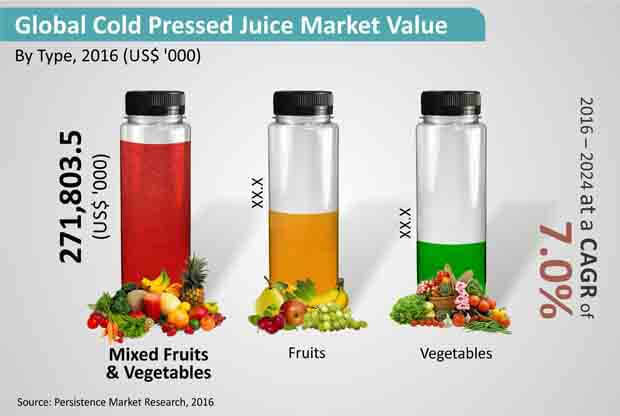 Mixed fruits and vegetables segment is expected to remain dominant in the global cold pressed juice market over the forecast period. The segment is expected to grow at a CAGR of 7.2% over the forecast period. Among the various type segments, the mixed fruits and vegetables segment is projected to register relatively high CAGR and gain significant market share by 2024 end in the global cold pressed juice market during the period of forecast. Demand for cold pressed juice made from mixed fruits and vegetables has been increasing significantly owing to growing concerns regarding various health issues as well as the health benefits associated with consuming these juices. The manufacturing process for cold pressed juices entails using a hydraulic press to extract 100% juice from fruits and vegetables. Furthermore, no additional heat or oxygen is used, which means no nutrients are lost during the process. As compared to other juices, nutrients, amino acids, phytonutrients, minerals, trace minerals, and enzymes are not lost during the extraction procedure in the case of cold pressed juices. These factors are fueling the growth of the mixed fruits and vegetables segment in the global cold pressed juice market. Rising health awareness among consumers is steadily causing a shift in preference towards safer, convenient, healthy, and refreshing beverages that are calorie-free, caffeine-free, and free from artificial ingredients, and this is creating robust development in the mixed fruits and vegetables segment of the global cold pressed juice market. Increasing demand for green beverages is also expected to increase during the forecast period. Manufacturers are also increasingly introducing flavors such as green juice with coconut water, cucumber, leafy greens, and splash pineapples to leverage growing demand among health conscious consumers and to address steadily rising market demand for healthy and natural juices. Also, an introduction of smooth green mixes with pineapple, apple, mint, and cucumber is likely to boost revenue growth of the mixed fruits and vegetables segment over the period of assessment. Rising demand for juices made from super fruits such as Acai, Blueberry, Pomegranate, Black Currant, Maqui Berry, Baobab, Cranberry and Goji is further contributing to market growth in the mixed fruits and vegetables segment of the global cold pressed juice market. In 2016, the North America cold pressed juice market accounted for a value share of a little over 35% in the global cold pressed juice market. Europe followed closely with a market value share of nearly 31%. The North America cold pressed juice market is projected to register a relatively high CAGR of 7.4% in terms of value, followed by the Europe cold pressed juice market, which is slated to grow at a CAGR of 7.0% in terms of revenue. By 2024 end, the North America region is expected to be a relatively attractive market for cold pressed juices. The segments that are likely to dominate the North America cold pressed juice market by the end of the forecast period are: Organic (by Nature) – in terms of high revenue share and high CAGR; Mixed Fruits and Vegetables (by Type) – in terms of high CAGR; Retail/Grocery Stores (by Distribution Channel) – in terms of relatively high value share. Within the North America region, the cold pressed juice market in the U.S is expected to account for a comparatively high revenue share and grow at a relatively high value CAGR over the forecast period.